There aren’t many people who can work a crowd like Mike Reilly. You could compare him to a top motivational speaker, sports announcer or even a stand-up comedian. But then again, none of those professions require you to engage your audience for 17 hours straight. Known as the ‘Voice of Ironman,’ Reilly has arguably become the most loved public figure associated with the sport. To some athletes, hearing Reilly say those four, iconic words is just about as important as making it to the finish line. When his voice booms, “YOU ARE AN IRONMAN!” over that microphone, lifelong dreams are realized. Reilly started race announcing in the late 1970s, with his first professional event in Solana Beach, Calif. He has called 113 Ironman races and announced at countless other sporting events. This October, Reilly will be making his 24th consecutive trip to Kailua-Kona, where he will once again call in some of the greatest competitors at the Ironman World Championship. Year after year, he continues to entertain, inspire and energize both athletes and spectators on the Big Island. Magical, magnetic, electric, indescribable – all words I’ve heard people use in an attempt to encapsulate what Kona is. It’s not that I don’t believe or understand what everyone has told me about this race, but I just think it is something you have to experience yourself in order to fully grasp it. I can talk with athletes, read stories and watch videos, but still, all of those things just tell me that you have to be there to really feel it. “When people hit that island for the first time, and they’ve heard me talk about it in the past, they’ll come up to me and say, ‘You were right. I had no clue it was this spiritual, this energy-giving.’ It really just is,” he said. In 2011, after 23 years of encouraging, dancing and congratulating, Reilly was inducted into the Ironman Hall of Fame. “Every year, when I’m landing in Kona on the lava field, it’s like I’m coming back home,” he said. You would think that after so many years of having the same gig, a person might become jaded – or at the very least, worn out – but not Reilly. This last part of his job is an understatement. If you’ve ever gotten to experience Reilly at a race, you know that there is no limit to his excitement. I was watching a video the other day in which he gets the entire crowd to do the YMCA just a few minutes before midnight and in horrible, freezing weather — something he does at many Ironman finish lines. Reilly goes on to explain that while each community embraces an Ironman event, Kona is on its own level. The emotion in his voice shows this is a passion he carries with him; something that stays with him long after he leaves Kona. How Reilly can continue to give it his all each time he gets on that microphone has become crystal clear. He has the opportunity to connect with others in a way that very few will ever get to experience. He is their guiding light and most vocal supporter while on what will probably be the most intense, personal journey of their life. Reilly is there for it all, from welcoming the winner to the very last finisher. Of course, the question has to be asked, which is his favorite to bring down that finish chute? There is no doubt about it, Ironman is a challenge like no other, one that transforms all those who take it on. “Once they finish, those athletes can handle anything that comes at them. What’s going to be their roadblock or their hurdle? They’ve gone over 140 hurdles out on the course,” Reilly says. If everyone that crosses that line transforms, then how does the man who is there cheering them on every step of the way? “Me? Oh, it changes me daily,” he says. 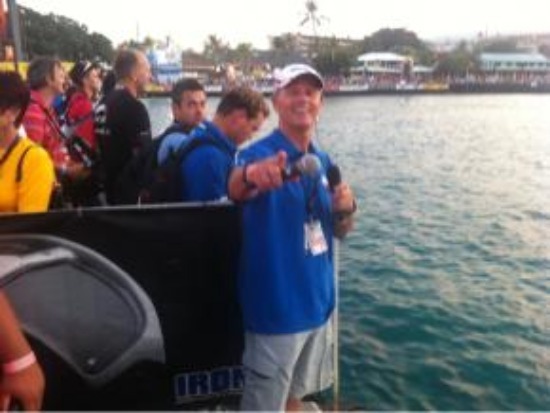 As he embarks on his 24th year announcing in Kona, you have to wonder, is there an end in sight for the Voice of Ironman? “I realize that one day, this will all be gone and I won’t be doing this anymore,” he says. “Eventually, I’ll have to cut back on how many races I go to. I don’t want it to ever get to the point where it’s like, ‘Ugh, we gotta push Reilly out. He’s got an oxygen tank on and he won’t get off the damn scaffold,’” he says laughing. Reilly’s son Andy has recently started to announce races with him and there is always a possibility that this could become a family affair.